Picture this, "Luigi" is in the design department at Alfa Romeo and while meandering his way to a long Italian lunch he spots the March-Alfa and 33 sports prototype engine sitting in a corner of a workshop and thinks wouldn't that fit in that prototype thingy we sent to that expo abroad and you probably have the full design process of the Montreal. 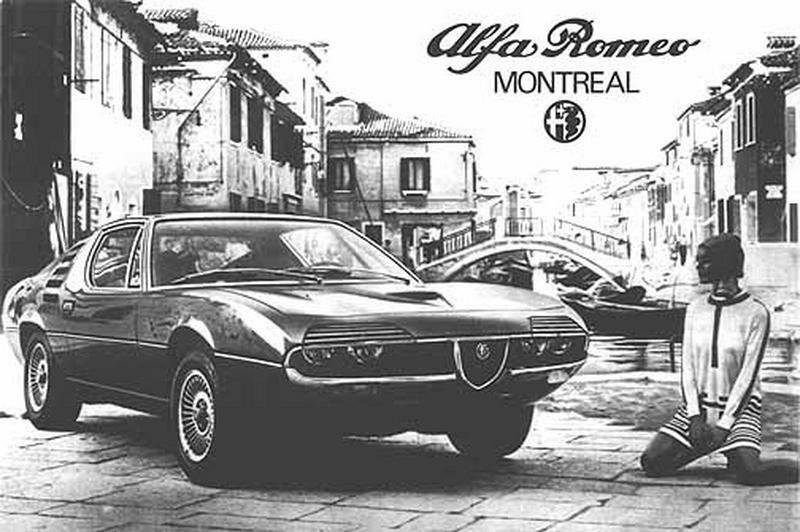 I exaggerate somewhat but the bare bones of the statement are true, the Montreal was Alfa Romeo's show car for the 1967 Montreal World Exhibition and it did have a detuned version of the engine from the 1971 March-Alfa/33 sports prototype. 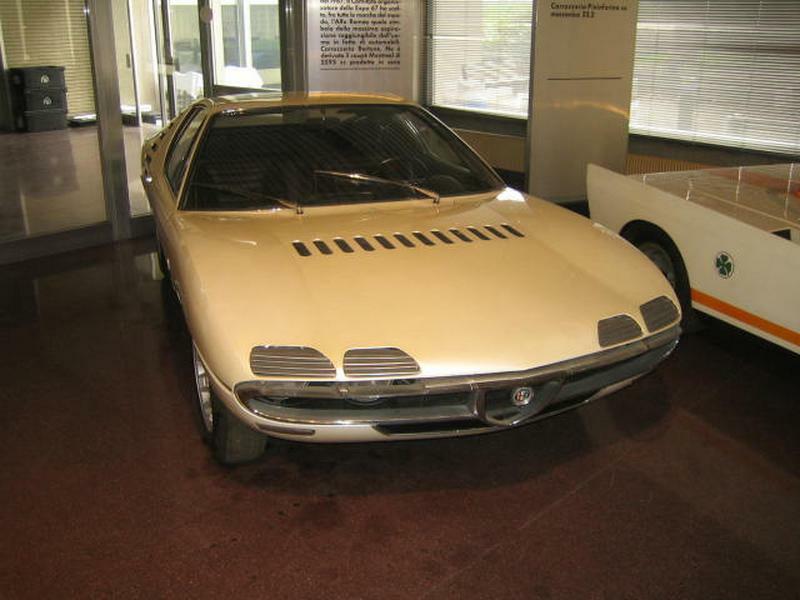 At the Montreal's début it was a pure concept car with a tuned version of Alfa Romeo's 4 cylinder Giulia engine amidships. 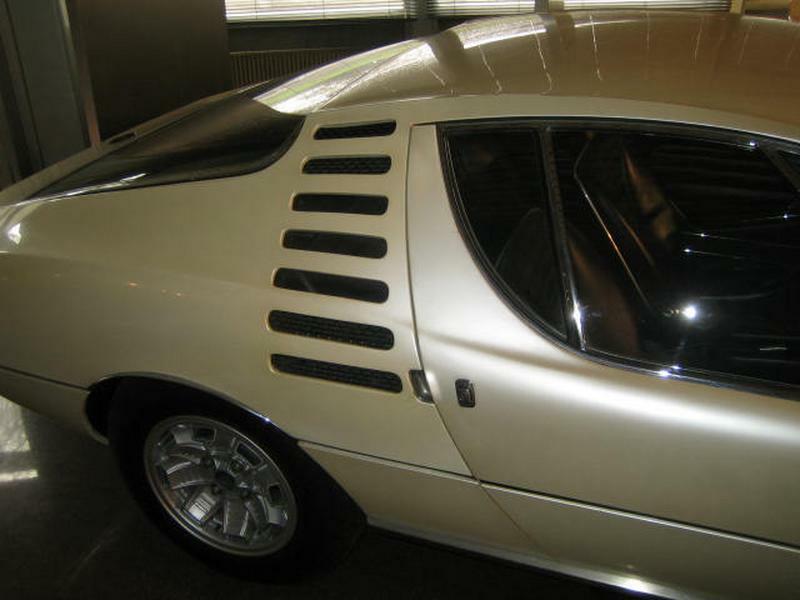 The styling was in a similar vein to Bertone's other designs of this period, look at a Miura or Espada in profile and you will see many features that are shared with the Montreal and the finished design is very faithful to the prototype. However the mechanicals are significantly different with a 2.6 litre 200 bhp V8 engine mounted up front, mated to a 5 speed gear box and then on to a modified Giulia live rear axle. 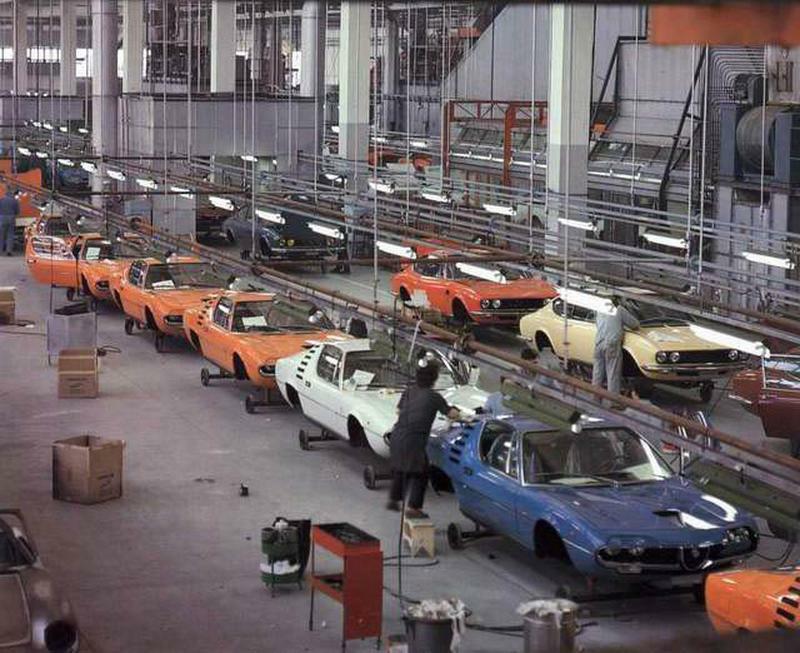 The car's gestation was a long one, over 3 years, and in this time there was considerable disagreement between Nuccio Bertone and Alfa Romeo's President Giuseppe Luraghi mainly over this change in the mechanical components. 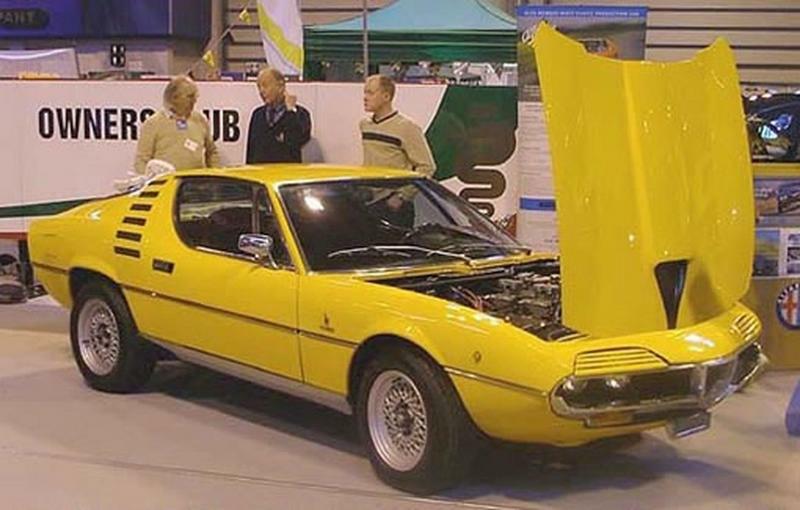 When eventually released the Montreal was indeed more of a GT than a sports car. The very over square V8 is a superb engine with a beautiful power delivery plenty of torque and a willingness to rev that you would expect from an engine with such a provenance. The engine has a twin plane crank so you get the V8 warble and that almost lazy rumble on acceleration which belies the mounting revs. Fuel delivery is by twin fuel pumps to a Spica fuel injection distributor which sits in the middle of the V and of course engine lubricant is supplied from a dry sump. The engine has twin overhead camshafts per bank, but unlike the 33 engine it has only two valves per cylinder, the exhaust valve though is of course sodium cooled, this is indeed the best and most advanced engineering of its day. As with all production 105 series Giulia's the gear change is superb with each ratio well placed for sporting driving and the change being light and precise. The power is transmitted to the road by a live rear axle which has a limited slip differential and an enlarged sump to aid oil cooling. The axle is located laterally by a T bar that mounts between the chassis legs and then onto the top of the differential, giving quite a high roll centre at the rear but securely locates the axle preventing it from moving when cornering. The front suspension is by double wishbones and these are much the same as any other member of the Giulia range, however the brakes are considerably up-rated with ventilated disks all round which are more than adequate, pulling the car easily down from its 220 km/h + top speed. The styling is very much of the era, many of the details being carried over from the prototype only one of the side louvers' is lost and the bonnet louvers are changed for a NASCAR duct. The prototypes eyebrows are retained and these have a very nice vacuum operated retraction mechanism, there are other nice period features like the camm tail but one thing that really places the Montreal in the 1970's are the colours especially the pastel shades like orange or green. 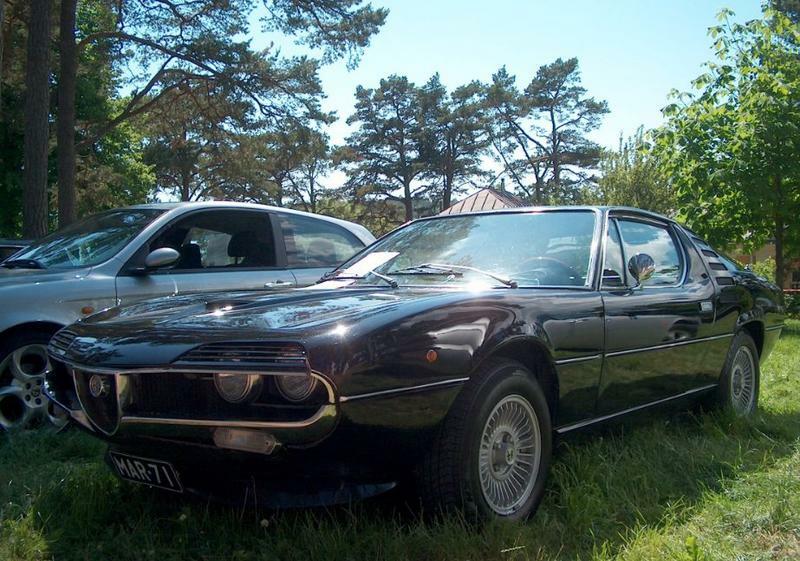 The Montreal was produced for 6 years from 1971 until 1977 and in that time 3,925 were produced and as with all limited production Alfa Romeo's the body and interior parts are difficult to source but unlike say a Junior Z, the engine parts are also difficult to find for a Montreal, however they are available if you are willing to hunt them out. 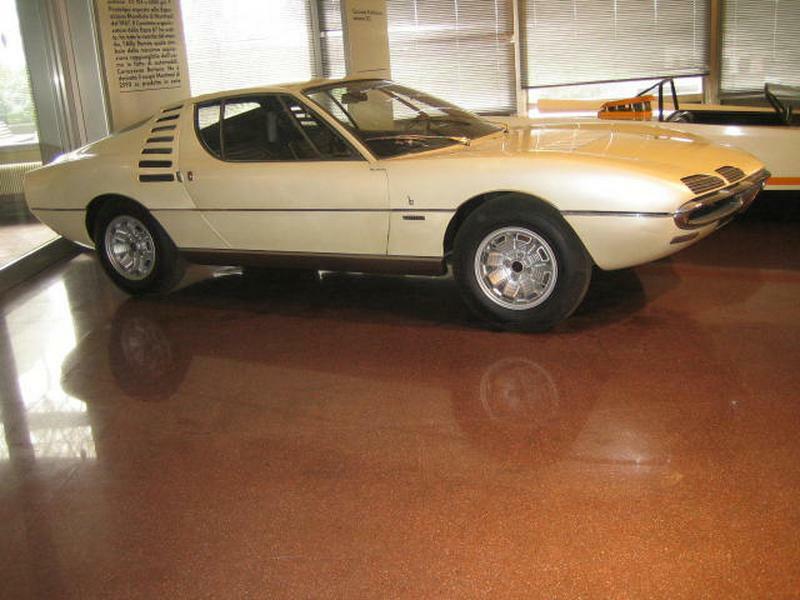 As a car the Monty is flawed and its sporting credentials would have been improved if it had a more sporting suspension set up, but this would have shown up the ultimate failings of using a live rear axle and so it was a compromise as suspected by Nuccio Bertone. However, the engine is amazing and as a GT it is one of the best. When released, it was in the same price range as the BMW 3.0 CS or the Mercedes 350 SL and it is more than comparable with them, but just imagine meeting their owners down the pub and letting it slip that you have a F1 derived engine in your car.